Scheduled for November 16th, at 3pm at Crab Orchard Museum. We are asking everyone who is planning on attending to RSVP by November 9th at the latest with a head count and so we can coordinated the meal and make sure there is enough for everyone. There will be no business just food and fun (perhaps some games) If you plan on attending please email Audra aphillips6369@gmail.com with your head count and intended dish. The location is subject to change depending on how many people intend to attend please check back here and watch your emails if you have provided Audra with one for updates. See you all on the 16th. Everyone is welcome to participate in making Prayer Ties. Our prayer ties will be placed in sacred places at the Pow Wow. Afterwards, we will also be completing the items for our community booth at the pow wow. Please bring your samples to show off. Also, bring feathers, leather and other fun stuff to help complete community items. 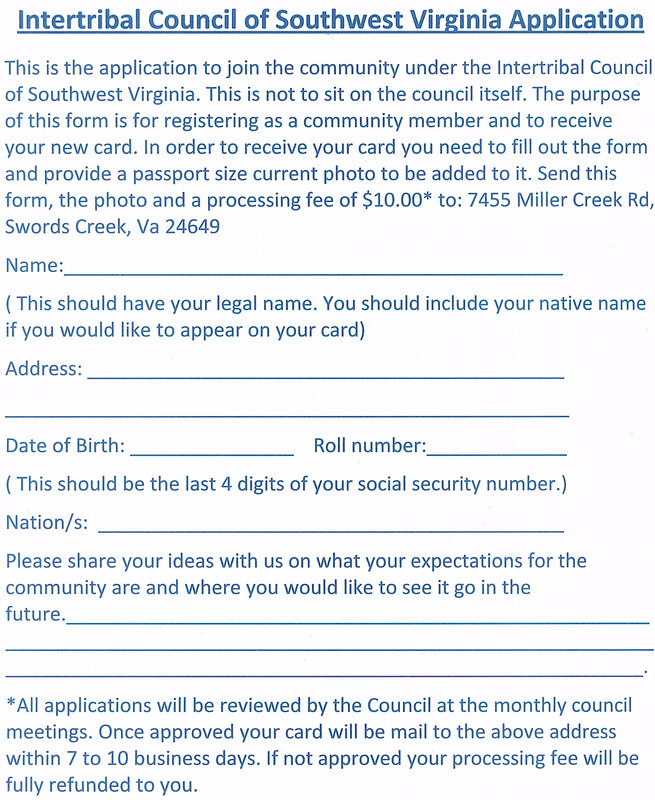 Please bring your Member Card Application to this meeting with a $10 processing fee and a current passport size photo (2″x2″) to the next meeting to receive your card. Click photo for a larger, printable copy. What if we made this a weekend event and did some camping and fishing and just hanging out? I would love that!! !